The purpose of this training is to facilitate implementation of the requirements of New Jersey’s new School IPM law by School IPM coordinators and other involved personnel. Attendance at this session by a School IPM Coordinator fulfills their training requirement per the regulations. Each attendee will receive a certificate of attendance. Pesticide credits for applicators will be issued as well. This course is sponsored by the NJ Association of Designated Persons. Invited speakers include specialists from the New Jersey Department of Environmental Protection, Rutgers New Jersey Agricultural Experiment Station (NJAES) Cooperative Extension, and private firms. Fee: There is no fee. Registration is free but limited and is on a first-come first- served basis. 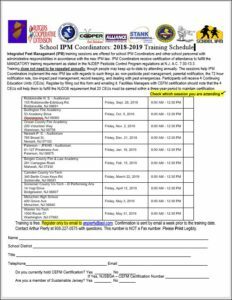 Course Information: See NJ School IPM Coordinator Reg Form 2018-2019. If you have any questions about the trainings, please contact Art Pierfy 973-627-0229 or email him at arthurp@rocktwp.morris.k12.nj.us. New Jersey Commercial Applicators are eligible to receive recertification credit for attendance at this course. Did you attend one of the School IPM Coordinator Trainings? Rutgers is conducting a follow-up study of the training program. Read more details about the Rutgers School IPM Coordinator Training Survey! Take the survey NOW: https://www.surveymonkey.com/s/M6CV2JY. 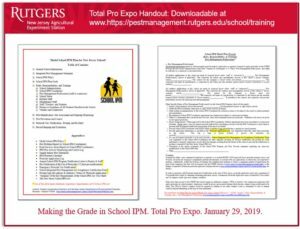 Making the Grade in School IPM – Total Pro Expo, January 29, 2019. Course covers how to implement a balanced pest control strategy that combines regular monitoring, record keeping and threshold limits to determine if and when treatments are needed. This is not the School IPM Coordinator Certificate Course. See details for that above. Design and implement an IPM program in your school. Step-by-step review for schools, including cafeteria, locker rooms, student lounges and grounds. Pest management programs in and around school grounds. Get valuable IPM reporting forms that can be used in planning an IPM program. Provides an update on changes in the rules and regulations. Call for course schedule. You may register online, by mail, or by phone. Continuing Education Units (CEUs) and/or NJDEP Certified Pesticide Applicator recertification credits are available for qualified participants. Six day course which covers technical skills to monitor, identify, control, and most importantly, prevent pest outbreaks by practicing good plant health care techniques. Also includes – record keeping, scouting, and biological controls. In order to take the certification exams to become licensed to use pesticides in NJ, an applicator applicant must satisfy PCP-approved training requirements for basic pesticide safety and on-the-job training for any categories that they wish to be licensed. Pesticide training specifically must provide an understanding of the principles of Integrated Pest Management. Course Schedules: The Rutgers NJAES Cooperative Extension Pest Management Office annually provides a printable flyer of the Basic Core Courses. New Jersey licensed commercial pesticide applicators are required to maintain their certification by attending courses awarding recertification credits in CORE and the categories in which they wish to maintain certification and licensing. Specifically, commercial applicators must complete a total of 8 CORE and 16 ‘category’ credits within five years beginning the first November following applicator certification. IPM concepts are covered with the category training; call the listed course moderator for details. Course Schedules: See the NJDEP Pesticide Control Program website for a schedule of approved courses.